Aryabhatta Geo-informatics & Space Application Centre is ready to hire the applicants for the 05 available seats of Scientific Professional, Computer Operator Jobs as per the AGISAC Recruitment 2017 advertisement published on department web portal. Job seekers who have required eligibility may apply after reading all the details of AGISAC Recruitment 2017 through this section.Candidates who have decided to build their career in this organization they can attend Walkin Interview which are going to be held On 3rd February 2017. Education Needed : Candidates who are willing to apply for AGISAC jobs must posses Graduation Degree / Post Graduation Degree from any recognized board or institution. Reserved category applicants will get the age relaxation as per AGISAC norms. Emoluments given to Employee: Contenders who will be appointed successfully for AGISAC Vacancy, they get the salary pay band of Rs. 20,000/- (Post 1), Rs. 18,000/- (Post 2), Rs. 8,400/- (Post 3) as per organization norms. Walk In Date : 03-02-2017. Click Here For AGISAC Official Notification Link. Madhya Pradesh Public Relation Department is ready to hire the applicants for the 12 available seats of Data Entry Operator Jobs as per the Madhya Pradesh Public Relation Department Recruitment 2017 advertisement published on department web portal. Job seekers who have required eligibility may apply through Offline Mode after reading all the details of Madhya Pradesh Public Relation Department Recruitment 2017 through this section.You are needed to send the application form in the appropriate format at the below address till or before 6th February 2017. Education Needed : Candidates who are willing to apply for Madhya Pradesh Public Relation Department jobs must posses Engineering Degree (IT / Computer Science) / BSc. / M.Sc. (IT / Computer Science) / BCA / MCA / Graduation Degree / Post Graduation Degree from any recognized board or institution. Reserved category applicants will get the age relaxation as per Madhya Pradesh Public Relation Department norms. Emoluments given to Employee: Contenders who will be appointed successfully for Madhya Pradesh Public Relation Department Vacancy, they get the salary pay band of Rs. 10,000/- as per organization norms. Last date to submit application form : 06-02-2017. Click Here For Madhya Pradesh Public Relation Department Official Notification Link. Indian Institute of Science Education and Research is ready to hire the applicants for the 27 available seats of Technical Officer, Engineer, Technician Jobs as per the IISER Tirupati Recruitment 2017 advertisement published on department web portal. Job seekers who have required eligibility may apply through Online Mode after reading all the details of IISER Tirupati Recruitment 2017 through this section.Candidates who meet the eligibility criteria and interested to apply they can submit their application form before the last date that is 15th February 2017. Education Needed : Candidates who are willing to apply for IISER Tirupati jobs must posses Graduation Degree / B.E. / B.Tech / Post Graduation Degree / Engineering Degree from any recognized board or institution. The candidates who wish to apply for the available vacancy should not be more than 35 Years (Post 1-9), 30 Years (Post 10). Reserved category applicants will get the age relaxation as per IISER Tirupati norms. Emoluments given to Employee: Contenders who will be appointed successfully for IISER Tirupati Vacancy, they get the salary pay band of Rs. 15,600 – 39,100/- plus 5400/- Grade Pay (Post 1,2), Rs. 9,300 – 34,800/- plus 4600/4200/- Grade Pay (Post 3-8), Rs. 5,200 – 20,200/- plus 2800/2000/- Grade Pay (Post 9,10). as per organization norms. Selection of the job hunters will be done on the basis of their performance in the Written Exam, Personal Interview, Skill Test conducted by the selection committee. Online Registration Ends On : 15-02-2017. Click Here For IISER Tirupati Official Notification Link. Kendriya Vidyalaya Barrackpore is ready to hire the applicants for the Various available seats of PGT, TGT, Doctor, Nurse, Teacher Jobs as per the Kendriya Vidyalaya Barrackpore Recruitment 2017 advertisement published on department web portal. Job seekers who have required eligibility may apply after reading all the details of Kendriya Vidyalaya Barrackpore Recruitment 2017 through this section.Candidates who have decided to build their career in this organization they can attend Walkin Interview which are going to be held On 18th February 2017. Education Needed : Candidates who are willing to apply for Kendriya Vidyalaya Barrackpore jobs must posses 12th / Diploma / B.E / B.Tech / Graduation Degree / Engineering Degree / Post Graduation Degree from any recognized board or institution. The candidates who wish to apply for the available vacancy should be existing between 18 - 65 Years As On 31-03-2017. Reserved category applicants will get the age relaxation as per Kendriya Vidyalaya Barrackpore norms. Emoluments given to Employee: Contenders who will be appointed successfully for Kendriya Vidyalaya Barrackpore Vacancy, they get the salary pay band of Rs. 27,500/- (Post 1), Rs. 26,250/- (Post 2,4,9,11), Rs. 21,250/- (Post 3,5,6), Rs. 1,000/- per day (Post 7), Rs. 7,50/-per day (Post 8), Rs. 18,750/- (Post 10). as per organization norms. Walk In Date : 18-02-2017. Click Here For Kendriya Vidyalaya Barrackpore Official Notification Link. Vikram University Ujjain is ready to hire the applicants for the Various available seats of Guest Faculty Jobs as per the Vikram University Ujjain Recruitment 2017 advertisement published on department web portal. Job seekers who have required eligibility may apply through Offline Mode after reading all the details of Vikram University Ujjain Recruitment 2017 through this section.You are needed to send the application form in the appropriate format at the below address till or before 8th February 2017. Education Needed : Candidates who are willing to apply for Vikram University Ujjain jobs must read official notification for post wise qualification. Reserved category applicants will get the age relaxation as per Vikram University Ujjain norms. The Last date For Acceptance of Application Forms : 08-02-2017. Click Here For Vikram University Ujjain Official Notification Link. District Selection Committee Krishna is ready to hire the applicants for the 13 available seats of Typist, Pharmacist, Lab Technician Jobs as per the District Selection Committee Recruitment 2017 advertisement published on department web portal. Job seekers who have required eligibility may apply through Online Mode after reading all the details of District Selection Committee Recruitment 2017 through this section.Candidates who meet the eligibility criteria and interested to apply they can submit their application form before the last date that is 6th February 2017. Education Needed : Candidates who are willing to apply for District Selection Committee jobs must posses 10th / Diploma / Graduation Degree from any recognized board or institution. The candidates who wish to apply for the available vacancy should be existing between 18 - 47 Years. Reserved category applicants will get the age relaxation as per District Selection Committee norms. Emoluments given to Employee: Contenders who will be appointed successfully for District Selection Committee Vacancy, they get the salary pay band of Rs. 16,400 - 49,870/- (Post 1,2,5), Rs. 21,230 - 63,010/- (Post 3,4). as per organization norms. Starting Date of Online Application Form Filling Is : 28-01-2017. Last Date To Apply Online Is : 06-02-2017. Click Here For District Selection Committee Official Notification Link. Uttar Pradesh Electricity Regulatory Commission is ready to hire the applicants for the Various available seats of Secretary Jobs as per the UPERC Recruitment 2017 advertisement published on department web portal. Job seekers who have required eligibility may apply through Offline Mode after reading all the details of UPERC Recruitment 2017 through this section.You are needed to send the application form in the appropriate format at the below address till or before 15th February 2017. Education Needed : Candidates who are willing to apply for UPERC jobs must posses Diploma / Graduation Degree / Engineering Degree / Post Graduation Degree from any recognized board or institution. The candidates who wish to apply for the available vacancy should be existing between 54 - 58 Years As On 01-10-2017. Reserved category applicants will get the age relaxation as per UPERC norms. Emoluments given to Employee: Contenders who will be appointed successfully for UPERC Vacancy, they get the salary pay band of Rs. 37,400 - 67,000/- plus Grade Pay of Rs. 10000/-. as per organization norms. Click Here For UPERC Official Notification Link. Department of Agriculture Tripura is ready to hire the applicants for the 04 available seats of Data Entry Operator Jobs as per the Department of Agriculture Tripura Recruitment 2017 advertisement published on department web portal. Job seekers who have required eligibility may apply after reading all the details of Department of Agriculture Tripura Recruitment 2017 through this section.Candidates who have decided to build their career in this organization they can attend Walkin Interview which are going to be held On 15th February 2017. Education Needed : Candidates who are willing to apply for Department of Agriculture Tripura jobs must posses Diploma / Graduation Degree from any recognized board or institution. Reserved category applicants will get the age relaxation as per Department of Agriculture Tripura norms. Emoluments given to Employee: Contenders who will be appointed successfully for Department of Agriculture Tripura Vacancy, they get the salary pay band of Rs. 7,000/- as per organization norms. Walk in Interview Held On : 15-02-2017. Closing Date to Submit the Application Form : 08-02-2017. Click Here For Department of Agriculture Tripura Official Notification Link. Tamil Nadu Physical Education and Sports University is ready to hire the applicants for the 06 available seats of Professor Jobs as per the TNPESU Recruitment 2017 advertisement published on department web portal. Job seekers who have required eligibility may apply through Offline Mode after reading all the details of TNPESU Recruitment 2017 through this section.You are needed to send the application form in the appropriate format at the below address till or before 6th February 2017. Education Needed : Candidates who are willing to apply for TNPESU jobs must posses Ph.D. / Post Graduation Degree from any recognized board or institution. Reserved category applicants will get the age relaxation as per TNPESU norms. Emoluments given to Employee: Contenders who will be appointed successfully for TNPESU Vacancy, they get the salary pay band of Rs. 37,400 - 67,000/- (Post 1), Rs. 15,600 - 39,100/- plus Grade Pay of Rs. 9000/- (Post 1), Rs. 6000/- (Post 2). as per organization norms. Click Here For TNPESU Official Notification Link. Karnataka Biodiversity Board is ready to hire the applicants for the Various available seats of Finance Assistant Jobs as per the KBB Recruitment 2017 advertisement published on department web portal. Job seekers who have required eligibility may apply through Offline Mode after reading all the details of KBB Recruitment 2017 through this section.You are needed to send the application form in the appropriate format at the below address till or before 10th February 2017. Education Needed : Candidates who are willing to apply for KBB jobs must posses Graduation Degree from any recognized board or institution. Reserved category applicants will get the age relaxation as per KBB norms. Emoluments given to Employee: Contenders who will be appointed successfully for KBB Vacancy, they get the salary pay band of Rs. 25,000/-. as per organization norms. Closing Date for Forwarding Filled Application Forms : 10-02-2017. Click Here For KBB Official Notification Link. Falta Special Economic Zone is ready to hire the applicants for the 13 available seats of Assistant Development Commissioner Jobs as per the FSEZ Recruitment 2017 advertisement published on department web portal. Job seekers who have required eligibility may apply through Offline Mode after reading all the details of FSEZ Recruitment 2017 through this section.You are needed to send the application form in the appropriate format at the below address till or before With In 45 Day's. 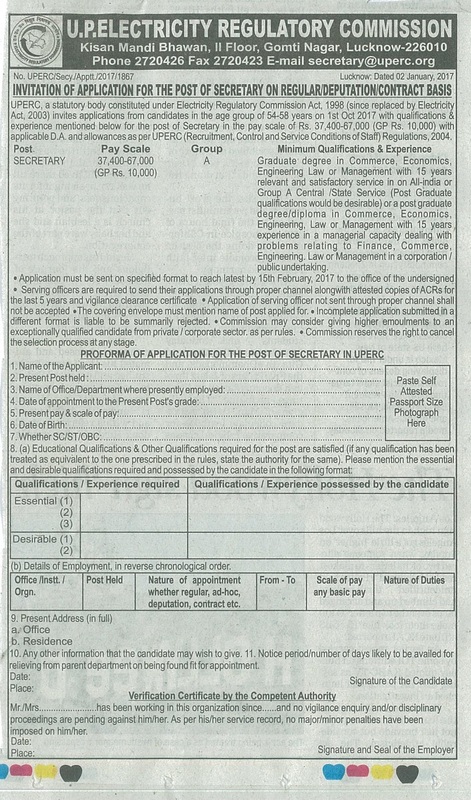 Education Needed : Candidates who are willing to apply for FSEZ jobs must read official notification for post wise qualification. Reserved category applicants will get the age relaxation as per FSEZ norms. Emoluments given to Employee: Contenders who will be appointed successfully for FSEZ Vacancy, they get the salary pay band of Rs. 9,300 - 34,800/- plus 4600/- Grade Pay as per organization norms. District Court West Godavari is ready to hire the applicants for the 02 available seats of Personal Assistant Jobs as per the District Court West Godavari Recruitment 2017 advertisement published on department web portal. Job seekers who have required eligibility may apply through Offline Mode after reading all the details of District Court West Godavari Recruitment 2017 through this section.You are needed to send the application form in the appropriate format at the below address till or before 6th February 2017. Education Needed : Candidates who are willing to apply for District Court West Godavari jobs must posses 12th from any recognized board or institution. Reserved category applicants will get the age relaxation as per District Court West Godavari norms. Emoluments given to Employee: Contenders who will be appointed successfully for District Court West Godavari Vacancy, they get the salary pay band of Rs. 17,500/-. as per organization norms. Deadline to Submit Hard Copy of Application Form Is : 06-02-2017. Click Here For District Court West Godavari Official Notification Link. Inter University Accelerator Centre is ready to hire the applicants for the 04 available seats of Scientist Jobs as per the IUAC Recruitment 2017 advertisement published on department web portal. Job seekers who have required eligibility may apply through Online Mode after reading all the details of IUAC Recruitment 2017 through this section.Candidates who meet the eligibility criteria and interested to apply they can submit their application form before the last date that is With In 45 Day's. Education Needed : Candidates who are willing to apply for IUAC jobs must posses M.Sc. (Physics) / Post Graduation Degree from any recognized board or institution. The candidates who wish to apply for the available vacancy should not be more than 26 Years. Reserved category applicants will get the age relaxation as per IUAC norms. Emoluments given to Employee: Contenders who will be appointed successfully for IUAC Vacancy, they get the salary pay band of Rs. 15,600 - 39,100/- plus Grade Pay of Rs. 5400/-. as per organization norms. Selection of the job hunters will be done on the basis of their performance in the Written Test, Personal Interview conducted by the selection committee. Dead Line For Apply Online : With In 45 Day's. Click Here For IUAC Official Notification Link. Wadia Institute of Himalayan Geology is ready to hire the applicants for the 12 available seats of Accounts Officer, Librarian, Multi-Tasking-Staff Jobs as per the WIHG Recruitment 2017 advertisement published on department web portal. Job seekers who have required eligibility may apply through Offline Mode after reading all the details of WIHG Recruitment 2017 through this section.You are needed to send the application form in the appropriate format at the below address till or before 23rd February 2017. Education Needed : Candidates who are willing to apply for WIHG jobs must posses 10th / Diploma / Graduation Degree / Engineering Degree / Post Graduation Degree from any recognized board or institution. Those aspirants who are belonging to General/ OBC Category & interested to apply for above posts they need to be paid Processing fee of 500/- (Post 1), 400/- (Post 2-3), 200/- (Post 4-7). Job hunters belonging to SC/ ST Category & interested to apply for above posts they need to be paid Processing fee of 250/- (Post 1), 200/- (Post 2-3), 100/- (Post 4-7). The candidates who wish to apply for the available vacancy should be existing between 45 - 56 Years (Post 1), 18 - 25 Years (Post 6). The candidates who wish to apply for the available vacancy should not be more than 35 Years (Post 2), 32 Years (Post 3), 28 Years (Post 4), 25 Years (Post 5,7). Reserved category applicants will get the age relaxation as per WIHG norms. Emoluments given to Employee: Contenders who will be appointed successfully for WIHG Vacancy, they get the salary pay band of Rs. 15,600 - 39,100/- (Post 1), Rs. 9,300 - 34,800/- (Post 2-3), Rs. 5,200 - 20,200/- (Post 4-7) plus Grade Pay of Rs. 6600/- (Post 1), Rs. 4600/- (Post 2-3), 2800/- (Post 4), 1800/- (Post 5-7). as per organization norms. Last Date for the Submission of Application : 23-02-2017. Click Here For WIHG Official Notification Link. Haveri District Court is ready to hire the applicants for the 28 available seats of Peon, Stenographer Jobs as per the Haveri District Court Recruitment 2017 advertisement published on department web portal. Job seekers who have required eligibility may apply through Offline Mode after reading all the details of Haveri District Court Recruitment 2017 through this section.You are needed to send the application form in the appropriate format at the below address till or before 16th February 2017 (Post 1) & 18th February 2017 (Post 2). Education Needed : Candidates who are willing to apply for Haveri District Court jobs must posses 7th / 10th / 12th from any recognized board or institution. Reserved category applicants will get the age relaxation as per Haveri District Court norms. Emoluments given to Employee: Contenders who will be appointed successfully for Haveri District Court Vacancy, they get the salary pay band of Rs. 9,600 - 14,550/- (Post 1), Rs. 14,550 - 26,700/- (Post 2). as per organization norms. Last Date of Receipt of Applications : 16-02-2017 (Post 1) & 18-02-2017 (Post 2). Click Here For Haveri District Court Official Notification Link 1. Click Here For Haveri District Court Official Notification Link 2. National Institute of Foundry and Forge Technology is ready to hire the applicants for the 41 available seats of Professor Jobs as per the NIFFT Recruitment 2017 advertisement published on department web portal. Job seekers who have required eligibility may apply through Offline Mode after reading all the details of NIFFT Recruitment 2017 through this section.You are needed to send the application form in the appropriate format at the below address till or before 28th February 2017. Education Needed : Candidates who are willing to apply for NIFFT jobs must posses Ph.D. / Engineering Degree / Post Graduation Degree from any recognized board or institution. Job hunters belonging to SC/ ST/ PWD (Persons with Disability)/ Ex-s Category are exempted from such payment of processing fee. Reserved category applicants will get the age relaxation as per NIFFT norms. Emoluments given to Employee: Contenders who will be appointed successfully for NIFFT Vacancy, they get the salary pay band of Rs. 15,600 - 39,100/- plus 6000/- Grade Pay (Post 1), Rs. 37,400 - 67,000/- plus 10,000/9000/- Grade Pay (Post 2, 3). as per organization norms. Click Here For NIFFT Official Notification Link. Agartala Municipal Corporation is ready to hire the applicants for the 15 available seats of Ward Secretary Jobs as per the Agartala Municipal Corporation Recruitment 2017 advertisement published on department web portal. Job seekers who have required eligibility may apply through Offline Mode after reading all the details of Agartala Municipal Corporation Recruitment 2017 through this section.You are needed to send the application form in the appropriate format at the below address till or before 7th February 2017. Education Needed : Candidates who are willing to apply for Agartala Municipal Corporation jobs must posses Graduation Degree from any recognized board or institution. The candidates who wish to apply for the available vacancy should be existing between 18 - 40 Years As On 01-12-2016. Reserved category applicants will get the age relaxation as per Agartala Municipal Corporation norms. Emoluments given to Employee: Contenders who will be appointed successfully for Agartala Municipal Corporation Vacancy, they get the salary pay band of Rs. 6,255/-. as per organization norms. Last Date to Submit Hard Copy of Application Form Is : 07-02-2017. Click Here For Agartala Municipal Corporation Official Notification Link. Zilla Panchayat Mahasamund is ready to hire the applicants for the 05 available seats of Accountant, Data Entry Operator Jobs as per the Zilla Panchayat Mahasamund Recruitment 2017 advertisement published on department web portal. Job seekers who have required eligibility may apply through Offline Mode after reading all the details of Zilla Panchayat Mahasamund Recruitment 2017 through this section.You are needed to send the application form in the appropriate format at the below address till or before 6th February 2017. Education Needed : Candidates who are willing to apply for Zilla Panchayat Mahasamund jobs must posses 12th / Graduation Degree from any recognized board or institution. Reserved category applicants will get the age relaxation as per Zilla Panchayat Mahasamund norms. Selection of the job hunters will be done on the basis of their performance in the Skill Test, Merit List conducted by the selection committee. Click Here For Zilla Panchayat Mahasamund Official Notification Link. North Eastern Development Finance Corporation Limited is ready to hire the applicants for the 07 available seats of Managing Director, Manager, Analyst Jobs as per the NEDFI Recruitment 2017 advertisement published on department web portal. Job seekers who have required eligibility may apply after reading all the details of NEDFI Recruitment 2017 through this section.Candidates who meet the eligibility criteria and interested to apply they can send their soft copy of application form through Email before the last date that is 15th February 2017. Education Needed : Candidates who are willing to apply for NEDFI jobs must posses Graduation Degree / Engineering Degree / Post Graduation Degree from any recognized board or institution. The candidates who wish to apply for the available vacancy should not be more than 52 Years (Post 1), 35 Years (Post 2), 32 Years (Post 3). Reserved category applicants will get the age relaxation as per NEDFI norms. Closing Date to Send Copy of Application Form Is : 15-02-2017. Click Here For NEDFI Official Notification Link. National Law University is ready to hire the applicants for the 02 available seats of Research Associate, Clerical Staff Jobs as per the NLU Delhi Recruitment 2017 advertisement published on department web portal. Job seekers who have required eligibility may apply through Offline Mode after reading all the details of NLU Delhi Recruitment 2017 through this section.You are needed to send the application form in the appropriate format at the below address till or before 31st January 2017. Education Needed : Candidates who are willing to apply for NLU Delhi jobs must posses LLM / Post Graduation Degree (social science) / Graduation Degree from any recognized board or institution. The candidates who wish to apply for the available vacancy should not be more than 40 Years (Post 1), 45 Years (Post 2). Reserved category applicants will get the age relaxation as per NLU Delhi norms. Emoluments given to Employee: Contenders who will be appointed successfully for NLU Delhi Vacancy, they get the salary pay band of Rs. 25,000/- (Post 1), Rs. 20,000/- (Post 2) as per organization norms. End Date To Submit Hard Copy of Application Form Is : 31-01-2017. Click Here For NLU Delhi Official Notification Link. Indian Institute of Technology is ready to hire the applicants for the 18 available seats of Registrar, Superintendent, Engineer Jobs as per the IIT Palakkad Recruitment 2017 advertisement published on department web portal. Job seekers who have required eligibility may apply through Online Mode after reading all the details of IIT Palakkad Recruitment 2017 through this section.Candidates who meet the eligibility criteria and interested to apply they can submit their application form before the last date that is 10th February 2017. Education Needed : Candidates who are willing to apply for IIT Palakkad jobs must posses Diploma / Engineering Degree / Graduation Degree / Post Graduation Degree from any recognized board or institution. The candidates who wish to apply for the available vacancy should not be more than 50 Years (Post 1), 45 Years (Post 2), 32 Years (Post 3-5), 27 Years (Post 6,7). Reserved category applicants will get the age relaxation as per IIT Palakkad norms. Emoluments given to Employee: Contenders who will be appointed successfully for IIT Palakkad Vacancy, they get the salary pay band of Rs. 37,400 - 67,000/- plus 10,000/- Grade Pay (Post 1), Rs. 15,600 - 39,100/- plus 5400/- Grade Pay (Post 2), Rs. 9300 - 34,800/- plus 4200/- Grade Pay (Post 3-5), Rs. 5200 - 20,200/- plus 2000/- Grade pay (Post 6,7) as per organization norms. Last Date of On-line registration : 10-02-2017. The Last date For Acceptance of Application Forms : 17-02-2017. Click Here For IIT Palakkad Official Notification Link. Sardar Vallabhbhai Patel University of Agriculture & Technology is ready to hire the applicants for the 05 available seats of Honorarium Teacher Jobs as per the SVBP Meerut Recruitment 2017 advertisement published on department web portal. Job seekers who have required eligibility may apply after reading all the details of SVBP Meerut Recruitment 2017 through this section.Candidates who have decided to build their career in this organization they can attend Walkin Interview which are going to be held On 31st January 2017. Education Needed : Candidates who are willing to apply for SVBP Meerut jobs must posses M.A (English) / M.Sc (Statistics / Maths / Biochemistry) / Post Graduation Degree from any recognized board or institution. Reserved category applicants will get the age relaxation as per SVBP Meerut norms. Emoluments given to Employee: Contenders who will be appointed successfully for SVBP Meerut Vacancy, they get the salary pay band of Rs. 12,000/- as per organization norms. Click Here For SVBP Meerut Official Notification Link. Nagaland Science & Technology Council is ready to hire the applicants for the 07 available seats of Research Associate, Fellow, Field Assistant Jobs as per the NASTEC Recruitment 2017 advertisement published on department web portal. Job seekers who have required eligibility may apply through Offline Mode after reading all the details of NASTEC Recruitment 2017 through this section.You are needed to send the application form in the appropriate format at the below address till or before 25th February 2017. Education Needed : Candidates who are willing to apply for NASTEC jobs must posses Graduation Degree / Post Graduation Degree / Ph.D. from any recognized board or institution. Reserved category applicants will get the age relaxation as per NASTEC norms. Emoluments given to Employee: Contenders who will be appointed successfully for NASTEC Vacancy, they get the salary pay band of Rs. 36,000/- (Post 1), Rs. 25,000/- (Post 2), Rs. 8,000/- (Post 3). as per organization norms. Closing Date of Offline Submission of Applications Is : 25-02-2017. Click Here For NASTEC Official Notification Link. Rajasthan University Of Veterinary And Animal Sciences is ready to hire the applicants for the 181 available seats of Professor, Instructor, Specialist Jobs as per the RAJUVAS Recruitment 2017 advertisement published on department web portal. Job seekers who have required eligibility may apply through Online Mode after reading all the details of RAJUVAS Recruitment 2017 through this section.Candidates who meet the eligibility criteria and interested to apply they can submit their application form before the last date that is 9th February 2017. Education Needed : Candidates who are willing to apply for RAJUVAS jobs must posses Post Graduation Degree from any recognized board or institution. Reserved category applicants will get the age relaxation as per RAJUVAS norms. Emoluments given to Employee: Contenders who will be appointed successfully for RAJUVAS Vacancy, they get the salary pay band of Rs. 37,400 - 67,000/- plus 10,000/- Grade Pay (Post 1,2,5), Rs. 15,600 - 39,100/- plus 6000/5400/- Grade Pay (Post 3,4,6). as per organization norms. Commencement of Online Application Form Is : 20-01-2017. Click Here For RAJUVAS Official Notification Link. Capital City Development and Management Corporation Limited is ready to hire the applicants for the 60 available seats of Engineer Jobs as per the CCDMCL Recruitment 2017 advertisement published on department web portal. Job seekers who have required eligibility may apply after reading all the details of CCDMCL Recruitment 2017 through this section.Candidates who meet the eligibility criteria and interested to apply they can send their soft copy of application form through Email before the last date that is 10th February 2017. Education Needed : Candidates who are willing to apply for CCDMCL jobs must posses Engineering Degree from any recognized board or institution. Reserved category applicants will get the age relaxation as per CCDMCL norms. Click Here For CCDMCL Official Notification Link. Tamil Nadu Uniformed Services Recruitment Board is ready to hire the applicants for the 15711 available seats of Police Constable, Jail Warder, Fireman Jobs as per the TNUSRB Recruitment 2017 advertisement published on department web portal. Job seekers who have required eligibility may apply through Online Mode after reading all the details of TNUSRB Recruitment 2017 through this section.Candidates who meet the eligibility criteria and interested to apply they can submit their application form before the last date that is 22nd February 2017. Education Needed : Candidates who are willing to apply for TNUSRB jobs must posses 10th / 12th from any recognized board or institution. The candidates who wish to apply for the available vacancy should be existing between 18 - 24 Years. Emoluments given to Employee: Contenders who will be appointed successfully for TNUSRB Vacancy, they get the salary pay band of Rs. 5,200 - 20,200/- plus Grade Pay of Rs. 1900/-. as per organization norms. Selection of the job hunters will be done on the basis of their performance in the Written Exam, Physical Fitness & Medical Test conducted by the selection committee. Dead Line of Online Application Is : 22-02-2017.